This class will build your critical harmonica skills in order to play blues, country, folk, roots , rock, and gospel music. To do that, we will focus on technique and play a range of songs. While having a whole lot of fun, the goal is for everybody to “fill their tool box” with skills and experience so each person can grow further with this tiny amazing instrument. We will play by ear and use harmonica “tab” – we won’t read standard music notation. 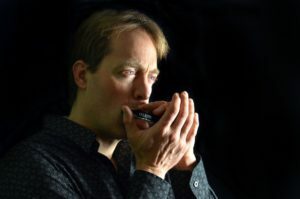 The class will work on nailing the clean note using the lip pursing / pucker style, focus on your improving tone, develop basic bending skills, add to repertoire and playing styles, and develop familiarity with basic harmonica positions (e.g., 1st and 2nd positions; others if time allows). We will also work single note and melody exercises, finding and playing scales, basic comping over blues progressions, beginning improvisation, and jamming. Finally, we will discuss using a harmonica rack to allow hands-free playing. The class is targeted at both newer players who are developing their skills beyond playing single notes as well as those who have played the instrument for some time. This means musicians from Level 2 to Level 3 (as per the FAMI guidelines (http://www.fami.ca/playing-experience-levels/) – a description that does not really speak to harmonica playing. Translating those descriptions to harmonica, let’s say L2 means playing single notes cleanly and L3 means you can play a major scale cleanly and have a good understanding of how to play chords. You don’t need to know how to bend notes. That’s the starting point for what we will be working on over the weekend. We won’t be spending time learning the basics of playing single notes, how to hold the harmonica etc. Please bring a 10-hole harmonica in the key of C. If you have other harmonicas, feel free bring them but, for this course, all materials will be put into the key of C. If you are going to buy a harmonica, please buy one that is of a reasonable quality (i.e., not a toy). Good quality brands available at Long & McQuade and other music stores are Hohner and Lee Oskar. Some of the better Suzuki models are also suitable. Expect to pay $40-60 for a reasonable quality harmonica. Cheap harmonicas make it difficult to play single notes cleanly and have a limited lifespan. We will not be playing chromatic harmonica (the one with button on the side) in the course. If you have a harmonica rack and want to learn how to use it, please bring it as well. I also recommend bringing a notebook, pen or pencil, and music stand. I am very excited to be teaching the Harmonica Level 2-3 class this August. I first picked up the harmonica on a road trip; it was the perfect instrument for travel. Since then I have evolved from making a racket to playing melodies, chords, solos, and fills in a variety of genres. These days, I play harmonica mostly in support of, and as solos within, folk, country, gospel, and rock music. I also play harmonica-based tunes and melodies, and some blues. I have led several workshops and classes for FAMI and am honoured to be a long-time Board member of the organization. I have also taught privately. I have taken music lessons / training for several instruments since I was young, and I have a guitar certificate from Berklee College of Music. Currently I am a multi-instrumentalist (mainly bass, with harmonica, acoustic / electric guitar) and vocalist in the Calgary-based band Horizon Ridge and guitarist / vocalist in the duo The Still Waters. Those groups have played at festivals, folk clubs, public and house concerts, and gala events in Canada and the US.